Microsoft is releasing its long-awaited Windows 8.1 upgrade as a free download for existing Windows 8 users starting on Thursday. Windows 8 was a dramatically different operating system that attempts to bridge the divide between tablets and PCs Windows 8.1 refines the new Windows experience with Microsoft implementing some feedback it received from users and added some features of its own on top. Here’s what’s new in Windows 8.1. Return of the Start button: Microsoft is bringing back its iconic Start button in Windows 8.1 Desktop mode. However, the implementation is not the same as pre-Windows 8 environment where the Start button would pop open a menu of apps and other settings. 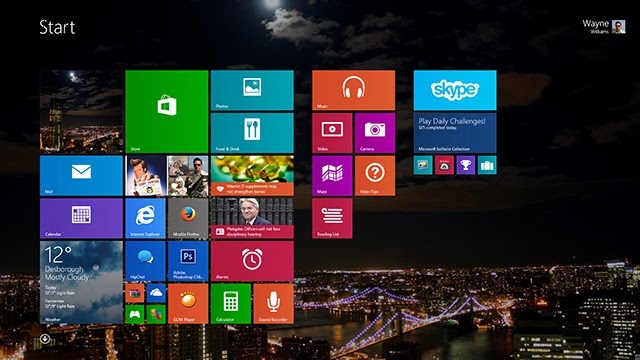 Instead, clicking on the button would lead users to a different Start screen where they can see all the apps that have been installed on the machine without Live Tiles. Boot to desktop: Now users will be able to directly boot their machine to desktop mode. Earlier Windows would only boot to the new user interface and users had to manually shift to the desktop mode every time. Multitasking: Windows 8.1 changes will let users resize the apps according to their preference and even have more that two apps snapped at any given point of time provided their display is high resolution enough. Search: Windows 8.1 brings universal search that would search for keywords on files stored locally, those stored on SkyDrive, keyword reference in apps, online search, photos and even Wikipedia. This is a huge feature, one that users would end up using a lot. Windows Store: Microsoft is also talking about easier discoverability of apps from the Windows Store. Installed apps will also download automatically and the limits on re-installs have been removed. SkyDrive: Microsoft’s cloud service, SkyDrive, was already integrated with Windows 8 and it gets even more tightly knit in Windows 8.1. Now all files will be automatically backed up on SkyDrive, which will also sync the user’s system settings, so whenever the user logs in from a different PC, those settings are already implemented. Other improvements: There are a lot of other improvements like Internet Explorer 11, which now allows unlimited tabs and syncs bookmarks across devices. There are improvements made to the keyboard and some new pre-installed Microsoft apps. The lock screen can work as a personal photo frame of sorts. One can even have animated background on the Start screen and there are more size options for Tiles that can be resized more easily when not using a mouse. The Window 8.1 update is free for current owners of Windows 8. Simply go to the Windows Store app to find it. It may take a few hours for updates to reach everyone.